Closing in on the end of the Easter season, one thought has been with me this entire past weekend….. This may sound simple phonetically. But take a minute to think about what this truly means. I’ve always been a very opinionated lady. Ever since I was a little girl I remember always being someone who could never really be told what to do. Grant it a lot of scenarios in my life, and the culture we live in, made me take up the “I have the right to do anything” approach to most things. My entire entrance to adulthood reflected that thought approach. I felt like I had the right to do anything and everything that I wanted to do and say what I felt needed to be said. The problem with that though, is that the only person you’re really considering in that mindset is yourself. I’m sure if you look above you will notice all the I’s mentioned. And living in the “I” zone of life will keep us from ever seeing from the Christ perspective. Learn how J.E. Berry came to see things from a new perspective by visiting JEBerrySpeaks.com. “Please pray. The pain is excrutiating…” was my feable request to a dear friend and prayer supporter before going on to talk about a commitment she had asked me to prayerfully consider taking on. I knew she was right. How many times had I told that to my patients? 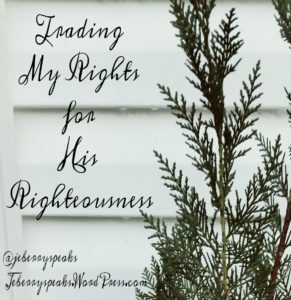 I humbly had to admit, “The pain has been unrelenting and it finally brought out the very ugly mom and wife in me.” How could I have let that happen? I knew better. I gently taught about this very issue to my patients repeatedly. I sighed. How could I argue with that? I remembered sharing with my friend in her own moment of pain how God taught me that lesson. Years ago my body finally broke and said “No more” and left me unable to do, unable to achieve, unable to drive it to the type-A, perfectionistic extremes I was used to pushing it to achieve. I wish I could say I finally learned my lesson. My body wishes the same thing. Pain is the signal that it’s time for a refresher course. But it never comes at a convenient time. That’s part of the lesson. If we don’t listen to our body’s signals, it will fight to be heard, and not when it’s convenient. 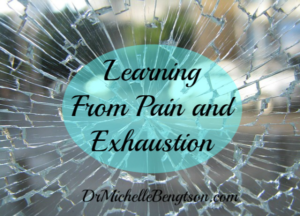 Visit DrMichelleBengtson.com to continue to learn how God speaks in pain and exhaustion. School’s out, it’s already hot, the kids are home, and I’m already tired. 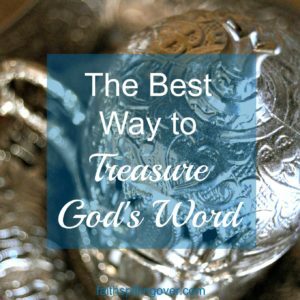 So I need my fellow Women at the Well and God’s Word more than ever. 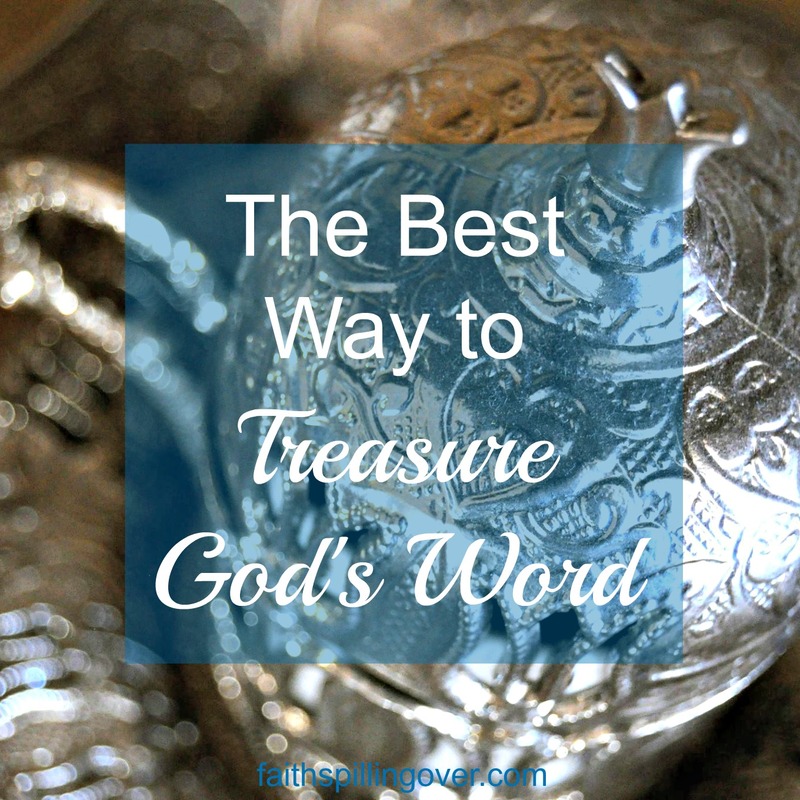 Visit Faithspillingover.com to learn how to get started. Alongside the highway that leads to our church, winds a bayou. Standing tall on the banks are massive trees. Many of their roots have become visible through erosion. Deep into the soil, reaching toward the bayou, these trees flourish. 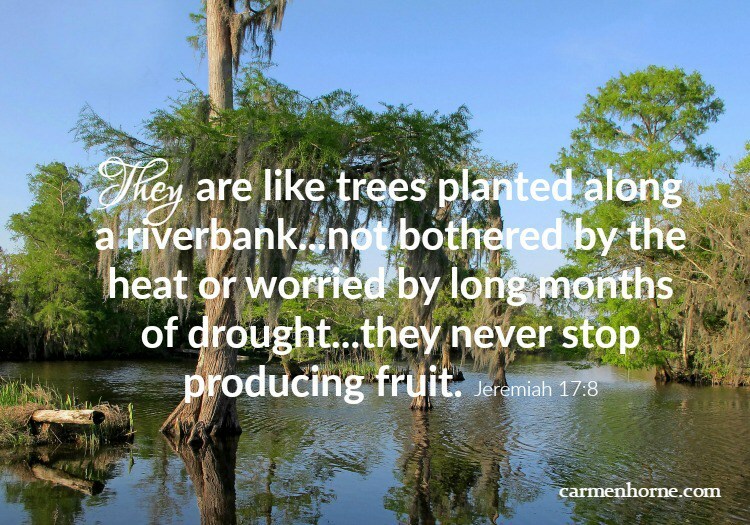 They have learned to not only survive their circumstances, but to thrive. 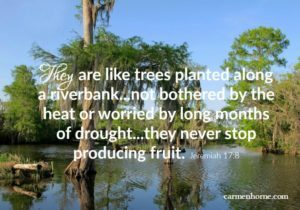 Visit CarmenHorne.com to learn more about trusting and hope.